So I am looking for some help. It seems that a few of my users Adoptables (Indian Ringnecks) have disappeared from "Manage Adoptables" and "My Adopts" and can only manage them when they type in a certain URL. It started happening around St. Patricks Day when I released the Ringnecks. How do I fix this? Secondly, I made an adoptable yesterday that errored and now it shows up in the list on the ACP but it says "Cockatiel April /'18 doesn't exist" so I can't delete it on the ACP. 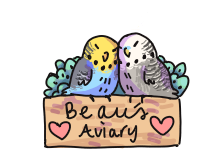 Anyone who has adopted it off the Adoption Centre now has an errored profile, adoptables page and any page that may feature an owned Cockatiel April /'18. How do I delete this guy for good to stop these errors? Finally, how do I get rid of the slashes before an apostrophe? Last edited by goofyunicorn; 04-05-2018 at 07:36 AM.